OXFORD, Miss. – The University of Mississippi’s campuswide work to reduce waste that winds up in landfills has led to the university being named “Recycler of the Year” among educational institutions in the state and recognized at Recycling Day at the State Capitol. The Mississippi Recycling Coalition honored the university with the award for its 2017 efforts, which included composting, recycling waste collected on Ole Miss football game days, “tree cycling” and mulching, and education programs. Several campus entities, including Facilities Management, Landscape Services and the Office of Sustainability, as well as the city of Oxford Recycling Department, contributed to the work. UM’s growing recycling program, compost program and educational outreach such as Green Week were cited among the university’s notable achievements in the area of waste reduction, said Lindsey Abernathy, associate director of the Office of Sustainability. She accepted the award at the Capitol on behalf of the university. The university has taken on several programs that have helped make UM a greener campus. A campuswide recycling program, which is operated by Facilities Management and through the city of Oxford Recycling Department, allows UM students, faculty and staff to recycle mixed paper, cardboard, plastics No. 1 and No. 2, aluminum and steel in recycling stations in all campus buildings. The Green Grove Gameday Recycling Program is a popular and well-known program in the Ole Miss student community. More than 650 students have volunteered with the program over the past two years. In 2017, the program diverted 2.78 tons of recyclables from landfills. This program is made possible through a partnership with Landscape Services, the Office of Sustainability and the city’s recycling department. The UM Compost Program has diverted more than 45 tons of pre-consumer food waste from landfills since its establishment in 2013 through collecting materials from campus dining locations. The finished compost is used in educational gardens on campus and is available to community members for purchase. The program also engages about 50 student volunteers each academic year through regular sifting events. While sifting the compost, students learn about the program, the importance of composting and the process through which composting takes place. Students working with the UM Food Bank, UM Garden Club and UM Compost Program have worked together to provide fresh food to students. They also reduce food waste and support the campus garden’s efforts to employ organic methods, such as the use of compost instead of chemical fertilizer, to grow produce. The Office of Sustainability employs students in its Green Student Intern Program each year to operate the Green Grove Gameday Recycling Program, UM Compost Program and to support additional waste-reduction initiatives. Students can also participate in the Green Grove Ambassadors Program. Members of the Green Student Intern Program, staff and volunteers regularly involve K-12 students in waste-reduction education programs. In fall 2017, staff and UM Eco Reps members helped collect food waste for composting at Oxford Elementary School as part of its annual Food Day Celebration. Staff members frequently speak to students about recycling and conduct tours of the compost site. Several other campus programs are part of the university’s broad efforts to reduce its carbon footprint and reuse as many materials as possible. 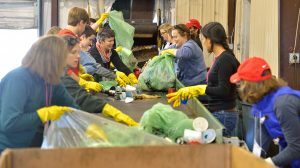 Ole Miss has been a very active member of the Mississippi Recycling Coalition for several years, so the committee was familiar with its work, said Jennifer Milner, state recycling coordinator for the Mississippi Department of Environmental Quality. But the overall scope of the programs impressed even those committee members.